In February, I was surprised when I received a Twitter mention from Renita at Be Your Own Kind when she nominated me for the Mystery Blogger Award. Thank you so much Renita! I hope I can do this award justice. I’ve heard of a few blogger awards but this one was new to me. It was created by Okoto Enigma to give recognition to blogs that haven’t been discovered yet. You can visit Okoto’s blog to learn more. 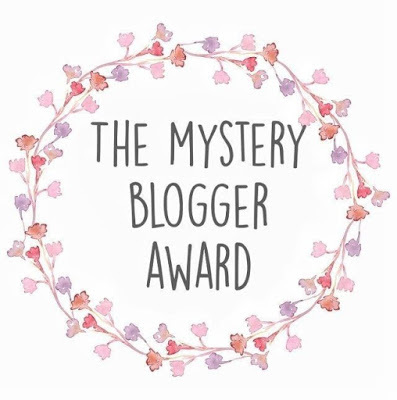 “Mystery Blogger Award” is an award for amazing bloggers with ingenious posts. Their blog not only captivates; it inspires and motivates. They are one of the best out there, and they deserve every recognition they get. This award is also for bloggers who find fun and inspiration in blogging; and they do it with so much love and passion. My favourite colour is purple. I’ll be honest with you all, I always have so much trouble trying to pick out blogs to nominate but here’s my list of 10. What about your blog makes you proud to be a blogger? Apart from blogging, what do you enjoy doing? What has been your biggest accomplishment (in life or in blogging) so far? What do you look for in other people’s blogs? Fun Question: If you were an animal, what would you be and why? What besides blogging are you passionate about? I guess you could say I’m passionate about food and gaming mostly. I have interests in so many things but I think those are the ones that I’m more passionate about. What message are you attempting to convey to the world through your blog? I don’t think I’ve really given that much thought apart from some of my posts raising some awareness and helping people. Ooh, that’s a hard question! If I had a super power, I think it would have to be super speed. Think of how many jobs I could get done with super speed. Weird Question: If you had the power to morph into any animal, what would it be? I think I’d have to say a penguin. They’re my favourite animal and in my opinion, in some ways are similar to me. I’m very clumsy sometimes, much like penguins but when they get in the water they are so graceful. I loved swimming when I was younger and swam competitively. My favorite staple question: Describe yourself in one word and explain your answer. Emotional. I’m definitely an emotional person. I’m the person who cries at films and TV shows; one of which was King Kong. I know, why would you cry at King Kong, right? To me it was so sad when he died falling from the Empire State Building when all he did was love the woman. He fell in love with her, thought she was beautiful and then he died. Just so sad! Nominees, now it’s your turn to pay it forward! Keep in mind that there is not a time-limit for you to create your post. 1. Put the award logo/image on your blog. 3. Thank whoever nominated you and provide a link to their blog. 4. Mention the creator of the award and provide a link as well. 5. Tell your readers 3 things about yourself. 6. Answer the questions you were asked. 7. Nominate 10-20 people & notify. 8. Ask your nominees any 5 questions of your choice; with one weird or funny question (specify). Thank you again Renita for the nomination! Anyone who participates, don’t forget to tag me in your posts so I can see your replies. Previous Post Video Game Challenge Day 10 | What game destroyed you emotionally? Next Post Video Game Challenge Day 11 | If you could only play one single-player game for the rest of your life, which game would it be? Thank you so much Glaire. I really appreciate that. Enjoyed reading your answers – I’m also the emotional one who cries at things most wouldn’t lol. oooo trained chef hey – if only all those you nominated got to come for dinner 😉 haha. Congratz on your nomination too. I'm Nikki, a 31 year old lifestyle blogger from the UK. Engaged to my Mr J. Philatelist. Bunny mum to Fudge. Amateur video gamer. Chef. Indie nail polish maker at Little Fudges Beauty Shop.